… when you look like a leaf, as this rather prehistoric-looking insect does. It’s a katydid, a close relation of crickets in the order Orthoptera, which also includes grasshoppers and locusts. 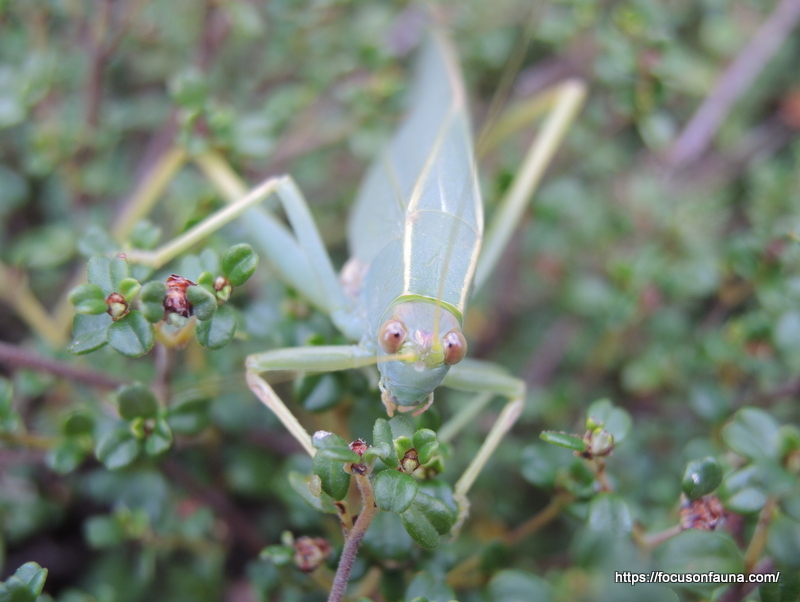 We think it’s a Gum-leaf Katydid, Torbia viridissima, although it is equally well disguised on the Callistemon sp. branch shown here as it would be among eucalypt leaves. Not so well hidden though when first found on the low Spyridium obcordatum shrub shown at right in our garden. In fact katydids are mostly nocturnal, so it was surprising to see it out and about in the afternoon. At night they ‘sing’ to attract females and protect territory by rubbing their wings together, rather like crickets . 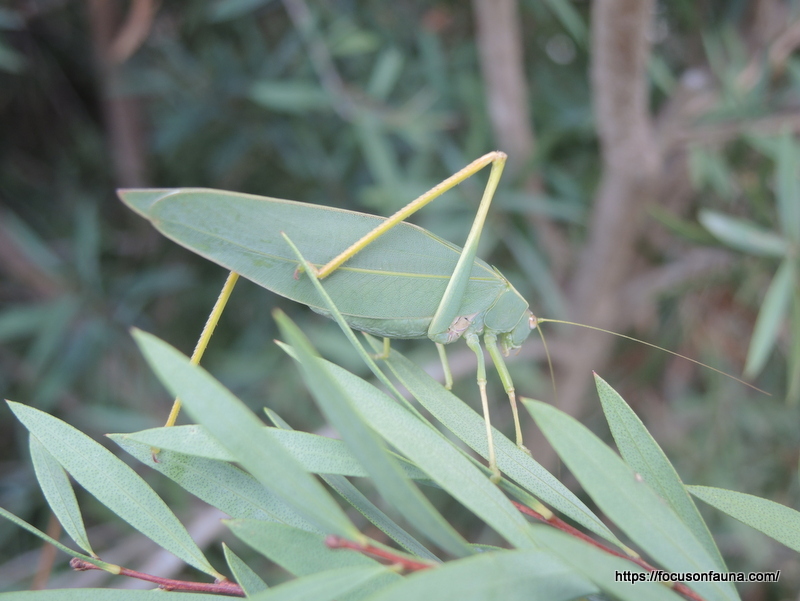 They feed on foliage and even small insects, although the Gum-leaf Katydid apparently feeds solely on gum leaves. 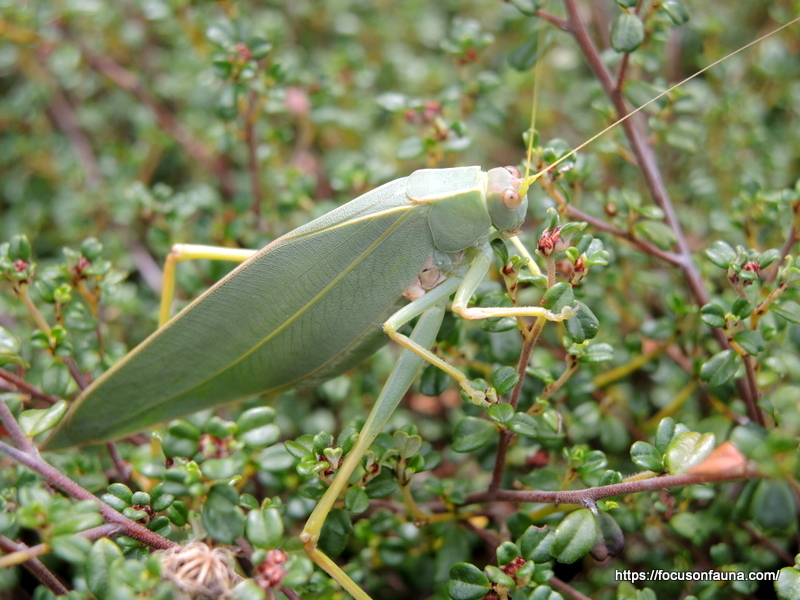 Katydids can sometimes be confused with praying mantids (order Mantodea), and with stick insects (order Phasmatodea), but the katydid’s enlarged hind legs in particular distinguish it from these other insect groups. So keep an eye out for ‘leaves’ with strong back legs!